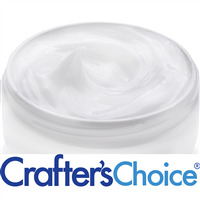 Crafter’s Choice Hand Creams are ready-to-use bases that can be used as is or customized with fragrance and color. Crafter’s Choice products are held to the highest industry standards. Upon arrival, they are inspected for content and purity. Contains Lanolin, Allantoin, and Aloe Vera. Lanolin has is popular in skin care because of its skin softening & emollient properties. Allantoin is thought to have the ability to help heal wounds, sores and stimulate growth of healthy tissue. Aloe Vera has long been considered to be a premier product for moisturizing and healing the skin.